Fully polished or original paint. We have two of these often overlooked INVISAFLEX machinists lamps constructed from square section steel arms with alloy base, neck joint, and shade. Similar in appearance to the better known MEK-ELEK the electrical flex remains completely concealed, passing through a rotating channel at each swivelling joint, hence the name 'Invisaflex'. These lamps have a circular alloy base plate specifically designed for vertical wall mounting, great for task lighting above a desk, sofa or bed. 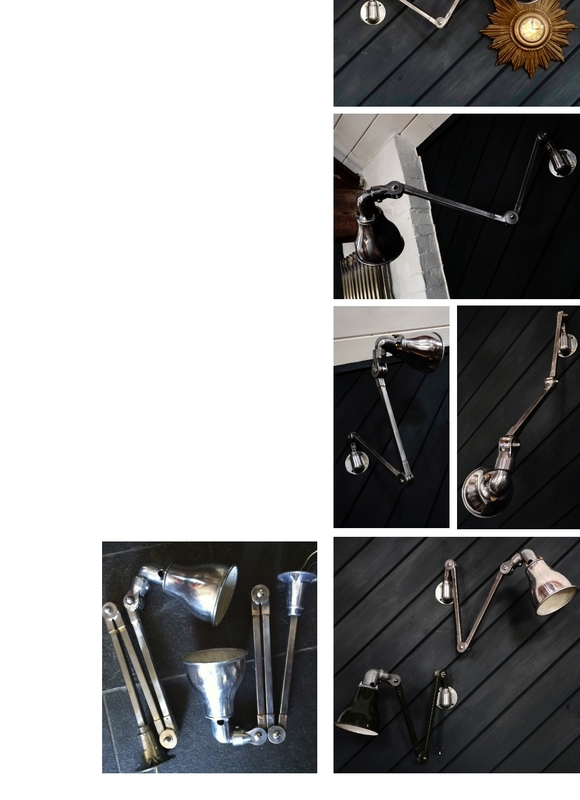 We have one fully polished lamp which has chromed joint covers and an alloy shade. The second lamp is in its original green paint with matching green and white vitreous enamel shade.If a matching pair are required we can supply both lamps fully polished with matching polished shades. These lamps are supplied re-wired with a short 'tail' for your electrician to connect to mains supply. They take a standard BC light bulb.